This is an autobiographic song. When you are young you have a lot of things in your head, that you are losing later. JJC: Voice, electric guitars, and bass, keyboards and drums programming. A very old song of mine. The original version took more than 9 minutes. You can understand that I removed some things. I have changed it into reggae rythm. This version was recorded on April 2006. A simple lie. Nothing more. JJC: Voices, electric guitars, electric bass and drum programming. My last song. Rercorded last Saturday the 5th of November 2005. 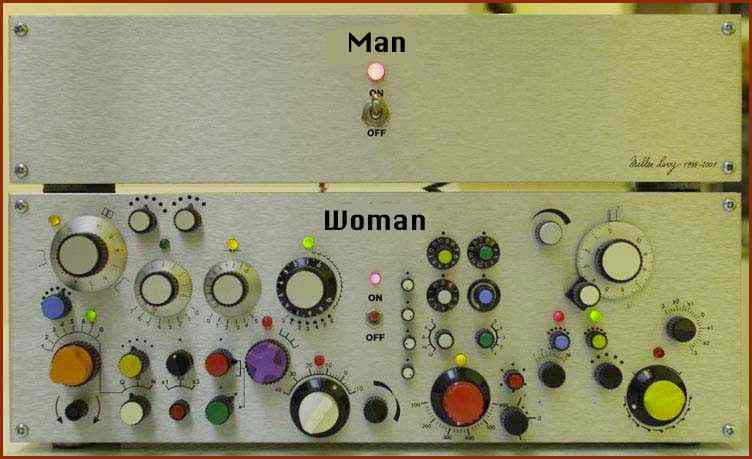 Check this picture for understanding how complicated are the man-woman relationships. This is a metaphore. I have passed a lot of time thinking around this subject. Why are the women so complicated? JJC: Electric guitars, acoustic guitar, voice and bass and drum programming. This is, by the moment, the last song I've recorded. I wrote it in June 2005. I used Cubasis on my computer, and I beg your pardon for recording the bass in MIDI. That day, I haven't any bass near me. If you are out of this world, you can think that all is wonderful, but there's a lot of work made behind these humble songs, and a lot of lost time of sleep. But it's worth. JJC: Voices, acoustic guitar, keyboards and programming. I recorded this song in the last eighties, when I spent more time with music and I lost a lot of time of sleep. Right now, i go to bed earlier. Time doesn't pass for free. In that time I was making my recordings in a multitrack cassette. For that time, it was fine. Then I hadn't any computer. I had a friend that is not between us now. He passed away. He had a mental illness. But he was a good person. This song is dedicated to him. I recorded the first version of this song long time ago. This version was recorded recently, in 2004, with better equipment. All it sounds better, except my voice, of course. An imaginated situation. Thanks God, this never happened to me, but maybe it has been lived by others. I don't wish this situation to anyone. This song talks about how easy is to lose, in a while, love and friendship. JJC:Voice, electric guitars, keyboards and drum, bass and keyboards programming. Recorded in the early nineties. It's a little long, but, for me, was very important to include the final reggae part.